About "Divisibility rule of 15"
In this topic divisibility by 15 first let us see the definition. All the numbers which are divisible by 3 and divisible by 5 are divisible by 15. Check whether the number 41295 is divisible by 15? Here we need to check the given number 41295 is divisible by 15 or not. To check whether the given number is divisible y 15 or not first we have to check whether it is divisible by 3 and it is divisible by 5. If the given number is divisible by both 3 and 5 we can say the given number is divisible by 15.So, first let us check 41295 is divisible by 3 for that we have to calculate the sum of the digits of the given number. 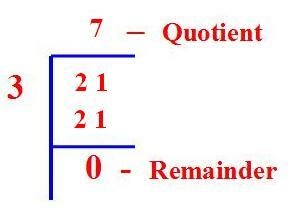 If we divide the sum of digits 21 by 3 we are getting 0 as the remainder. So we can decide it is divisible by 3.To check whether it is divisible by 5 we need to consider the last digit, that is 5. So it is divisible by 5. Hence the given number is divisible by 15. Check whether the number 2900 is divisible by 15? .If the given number is divisible by both 3 and 5 we can say the given number is divisible by 15.So first let us check 2900 is divisible by 3 for that we have to calculate the sum of the digits of the given number. The sum of digits is 11 which is not divisible by 3. But the given number 2900 is ending with 0. So we can say it is divisible by 5. Since it is satisfying only one condition we can say the given number is not divisible by 15. After having gone through the stuff given above, we hope that the students would have understood "Divisibility rule of 15"
Apart from the stuff given above, if you want to know more about this topic, please click here.